This mod is a massive rebalance mods for many, many aspects of the game. It includes changes to basic attributes, skills, talents, status effects and even environmental damage. I have spent an entire month working on this. Most of the stuff have been tested in-game. Hope you guys like it. Meaningful Weapon Choice This weapon choice mod is part of this massive mod. Welcome to my Massive Skill Rebalance mod for DOS2. I have spent an entire month working on this. Most of the stuff have been tested in-game. The numbers have been tweaked for at least a dozen of times. I hope you guys like it. 1. Massive rebalance of 90% of the skills in the game. Some of the skills have undergone major overhaul. 2. Primary attributes have been updated, so if you have some odd points of Str on your mages due to equipment, those attribute points won't be wasted. 3. Minor buff to some of the talents that are decent, but not on the "must have" tier. 4. Environmental damage and status effects have been updated. 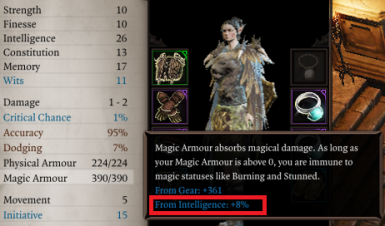 Each point of Strength gives 0.5% of physical armor, while intelligence gives 0.5% magic armor. Finesse gives 0.2% dodge per point as well. Constitution is buffed to 8% vitality. These changes won't show up when you point the cursor on the primary attribute, but you can see it when you look into the details of your armor values. Major overhaul of Phoenix Dive. Damage of Battle Stomp has been reduced, while Whirlwind and Battering Ram are buffed. Overall Warfare damage is unchanged, I just moved the damage around so it's not all concentrated on Battle Stomp. Whirlwind now clears surrounding surfaces. Taunt now reduces enemies resistances, accuracy and dodge. Major overhaul for Throwing Knives, Gag order, Sleeping Arms, Cloak and Dagger, Sawtooth Knife and Corrupted Blade. Yes, almost every skill has been heavily changed. Throwing Knives deals incredible damage to distant target, but is weak on nearby target. Sleeping Arms is now 1AP non-lethal attack that destroys Physical Armor. Gag order no longer needs a weapon. It scales with Fin so Spear uses can have a new skill to use. Overhaul for Pin Down, Ballistic Shot, Farsight and Assassinate. Ballistic Shot now has lower base damage, but gains 7% damage bonus per 1m distance to target. So it's weaker on nearby target, but still very strong on distant enemies. Farsight gives 20% bonus crit chance. Enjoy! Number adjustment for almost every attack skill. Overall damage output should be consistent with original game, but the damage is moved around so it's not concentrated on Barrage and Ballistic Shot anymore. Elemental Arrow is renamed Elemental Weapon. It now works with any weapon. Blood infusion now gives piercing damage instead. Overhaul for Hull Horns and Wings. Big nerf to Spin Web, but it's still strong on melee enemies. Overhaul for Shackle of Pain: Now deals damage based on your current vitality. Only transfer 80% of damage instead of 100%. Infect has been buffed a lot. Now it's so strong that I have to nerf the disease status a little bit (35% damage penalty changed to 30%). Black Shroud is now a really fun skill to use, because it applies so much status effects on enemies. Bleeding is now penetrates Physical Armor. Enjoy bursting people down once you break through their Magic Armor. Rock Spikes is now you 3AP AOE nuke for Earth damage. Worm Tremor is buffed a lot, probably too much though. Poison damage is now the strongest DOT in the game. You can cast Cryogenic Stasis on enemies for CC without breaking armor. Blinding Radiance is now your cheap 1AP AOE for Aero school. Most of the Source Skills are changed, a lot. This includes characters' source skills. Dome of protection now gives more armor recovery on the first turn, but less later on. So characters who hug each other inside the dome won't be invincible forever. Break the Shackle now recovers 20% of Physical and Magic Armor. 1. Read through the description for every single skill. They will tell you what have been changed. 2. Loading this mod for the first time will take a while (5-10 minutes). So be patient.